It's nearing December, and you know what that means? Another Hobbit film. These along with the Lord of the Rings series have become almost staples to the Holiday season. Last year, we overall enjoyed the first installment of the Hobbit series, even if it felt a tad long and more set up than actual story. My cohort was able to check it out in the sweet 48 fps, and based on talking to him, I will not be missing out on the 48 fps this time around. While THE UNEXPECTED JOURNEY felt like a lot of set up, THE DESOLATION OF SMAUG will be the meat of the book. It already looks more action packed and seems to have some better character development than the first film. Also, how can you not love all the scenery Cumberbatch will chew up and sit out as the voice of Smaug!? Check out the trailer after the break. Damn spiders! That will be my downfall to this film. Though I wish this trailer was chalked full of more Cumberbatch and interactions between Smaug and Bilbo, I am secretly thankful because those scenes have been something I've anticipated since I first read the book. Though the first film wasn't my favorite of the films about this world, based on this new trailer, I am very much anticipating this part. 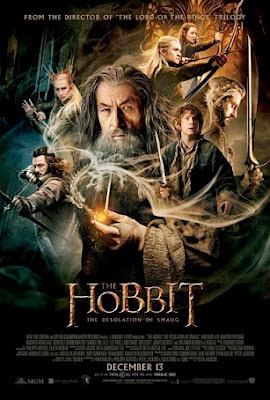 THE HOBBIT: THE DESOLATION OF SMAUG will be released December 13, 2013, directed by Peter Jackson, and stars Martin Freeman, Richard Armitage, Ian McKellen, Evangeline Lily, Luke Evans, Lee Pace, and Benedict Cumberbatch.